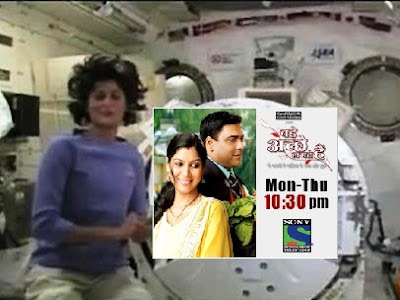 A few days back Indian astronaut Sunita Williams in a video message live from space thanked Ekta Kapoor for bringing an inspiring & immensely thought provoking TV serial "Bade Ache Lagte Hai" to indian audiences. She also said "I never fail to miss any episode of this TV serial.Ram Kapoor's acting & dancing skills are beyond par. I totally love the way how both Ram & Priya , the main protagonists of the show, never unite for months no matter how many coconuts are broken across temples in India in the faint hope to see them unite atleast once." "I do watch India TV for all news updates related to the alien world. Their team is doing a great job covering extraterrestrial activities. When I feel lazy I switch to Aastha TV where Baba Ramdev does his Yoga. I must admit it's a real pleasure seeing someone sweat it out as I chew my chicken burger with extra cheese in it. I wish him well in all his future ventures & adventures"
Reporter : "Ma'am by adventure are you hinting at his Ramlila Maidan fleeing incident??" Sunita "Cough !!! Cough!! Of course how can can anyone forget that marathon run.It is very generous of Babaji that he decided to promote women rights by wearing salwar kameez before fleeing the venue.He is a true visionary.I mean figuratively not literally considering his squint eye." To this news Ekta Kapoor reacted "I am totally humbled by the response of such a great personality like Sunita.I feel so glad to know that I have successfully managed to fool audiences in the outer world too.Yaay!!" A source from Balaji Telefilms on the condition of anonymity said "It's all a conspiracy to boost the show's falling TRP levels.Thanks to the number of flops her brother Tushar Kapoor (aka Tusshar Kapoor for numerological reasons, not that it made any difference to his career graph) delivers regularly year after year our production house is amidst a grave financial crises. Since the time he made Uday Chopra as his mentor we have started producing bigger budget flops. We might file for bankruptcy soon." "We do advise astronauts to watch their favourite shows while on a mission which are streamed live via satellite. 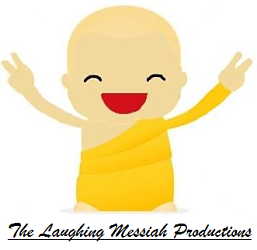 This because as an organization we believe that a work life balance should be striked upon & considering that the astronauts are in a zero gravity zone which makes them out of balance either ways, entertainment becomes a pertinent source of survival. Statistically speaking astronauts that watch TV onboard take 15% less loo breaks during the mission compared to astronauts that do not watch TV at all. This helps in improving our overall efficiency." Tusshar Kapoor updated his Facebook status "Congrats Ekta didi!! This song is dedicated to u!! Phoolo ka taaro ka sabka kehna hai ek hazaaro mein meri behna hai.Saari umar hume audience ko pakana hai (CHORUS) LA LA LA LAAA LA LA LAAAA LAAA LALA LA" Our investigations reveal that his grand fan following 2.5 homo sapiens 'liked' this status update. An elated Ram Kapoor said "It's great that people from prestigious organizations like NASA have recognized our work. This paves our way further to the NASA headquarters where we can do our future episodes. In fact our director just sent an SMS to me saying "1000th episode script confirmed.Pihu joins NASA as an astronaut." When asked his views on the whole matter the ISRO Director Mr Balasubramaniam said "WTF is she doing up there???" "Species of the outer world like Sunita have had close ties with Bollywood ever since I casted Jaadu in my film Koi Mil Gaya.It's rather disappointing to know that Jaadu used me as a stepping stone to success. I have heard rumours that he is featuring in Yash Chopra's next big banner film.I am seriously considering resigning from my post as the India Chapter chairman of PETA (People for the ethical treatment of aliens)." Reporter: "But sir, I would like to correct you. Sunita is not a species of the outer world as you just said!!." Rakesh Roshan "Oh don't try fooling me. As if I don't know that she is trying to evade taxes by migrating into space.Loser!!" b) A homo sapien with the same IQ as him or possibly much lower. In either which case your existence on the planet serves not much purpose besides defaming your family,Pinky aunty next door & your neighbourhood halwai. For more breaking news updates click here ! !